إذا كنت تبحث عن فندق بموقع جيد في بينغوين، فقد وجدت ضالتك في Penguin Waterfront Escape . يمكن من هنا للضيوف الاستمتاع بسهولة الوصول إلى كل ما تقدمه هذه المدينة النابضة بالحياة. يضفي محيط الفندق اللطيف وقربه من ‪The Penguin Market‬, ‪Giant Penguin‬, ‪Penguin General Cemetery‬ سحراً خاصاً على هذا الفندق. إن الخدمات الممتازة وحسن الضيافة العالي في Penguin Waterfront Escape تجعل إقامتك تجربة لا تنسى. يقدم الفندق فرصة للاستمتاع بشريحة واسعة من الخدمات بما فيها: واي فاي مجاني في جميع الغرف, تخزين الأمتعة, واي فاي في المناطق العامة, صف السيارات, غرفة عائلية . استمتع بوسائل الراحة الراقية في الغرف أثناء إقامتك هنا. بعض الغرف تتضمن تلفزيون بشاشة مسطحة, اتصال لاسلكي بالإنترنت, غرف لغير المدخنين, مكيف هواء, تدفئة لمساعدتك على استعادة طاقتك بعد يوم طويل. يقدم الفندق مجموعة رائعة من الخدمات كمثل مسار جولف - ضمن 3 كم, ملعب للأطفال, حديقة، لجعل إقامتك تجربة لا تنسى. استمتع بخدمات لا يعلى عليها وعنوان ذو اعتبار في Penguin Waterfront Escape . What a wonderful place to spend a few days! The 2BR apartment was modern and spacious and equipped with everything you'd want...but of course the location and the big water view is what makes this accommodation really special, and the photos don't really do it justice - it's great. We love the North West Coast, and Penguin is our new favourite location - close to everything yet far enough away. We'll definitely be back. We stayed in the Retro unit, which was decorated very smartly and had a view of the water. It was lovely and peaceful, and our hosts were friendly and easy to contact. We'd love to stay again. Apartment is beautiful, pristine, fully fitted out: exceptional- well worth spending a few nights there! Wow! We were very impressed with this modern, well designed and comfortable apartment. Arriving on a sunny afternoon the front deck overlooking the beach was a haven for a relaxing afternoon happy hour. Above the news agency and close by to shops and restaurants made our stay hassle free. . Communication with the owners was extremely easy as they live next door and Terry was very friendly and approachable. Very dated. Needs quite a bit of work. The location of the apartment was perfect, overlooking the beach and with uninterrupted sea view. 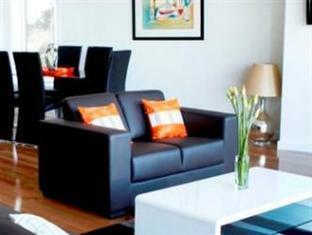 The apartment itself is very modern with great furnishings, very stylish. We really couldn't have asked for anything more, it really made our stay ideal. A very lovely partment managed by a very helpful couple.. value for money and you won't regret any. Nicely room for relaxing. It's perfect staying place in Penguin. Note that this review is for the new 1 bedroom retro apartment for this hotel. This was a beautiful room with fantastic attention to detail and the highest quality inclusions. 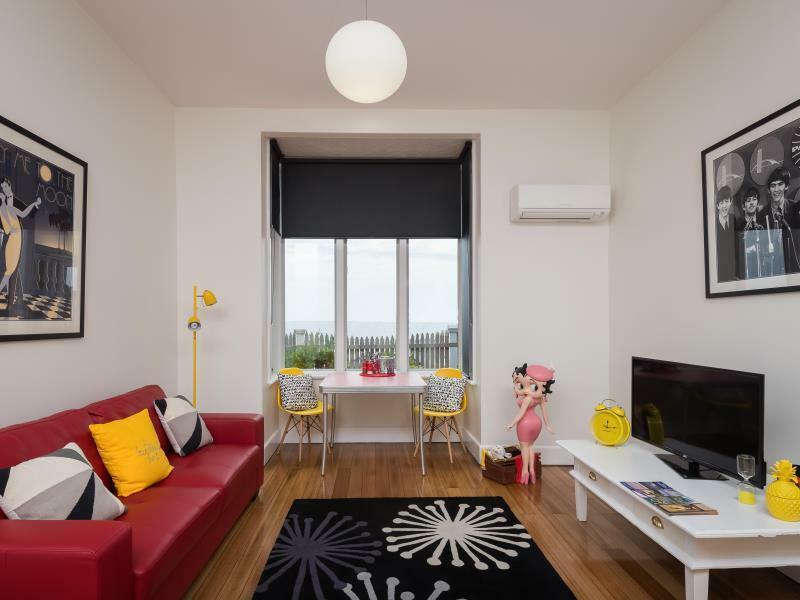 However, note that there are several differences between this apartment and the two bedroom apartments pictured on the website: it is a ground floor apartment, there is no outdoor space with a view of the water, the kitchenette does not contain a cooktop or an oven, there is no bath. Also note that even though described as a 1 Bedroom, a more accurate description would be a luxury studio as there is no actual wall separating the bed area from the living area. We miss the night we stayed in this apartment. This apartment is well equipped. The view outside the balcony is gorgeous!! !